1. Life - Life is represented by the heart icon and you can have a maximum of five lives. 2. Gold - Gold is the premium currency of the game. You can use it to get more moves or more time. 3. Gold must be purchased with real currency. 4. Purchases are considered -In app- purchases and will be charged to your mobile device. The larger the bundle you purchase the better overall rate you will receive. 5. You can restore purchased levels by going to -Settings- and pressing -Restore Purchases- . This unlocks all the levels and will work in perpetuity with your account. 6. This game is a social game as it lets you connect your Facebook account. 7. You can ask and receive lives from friends. 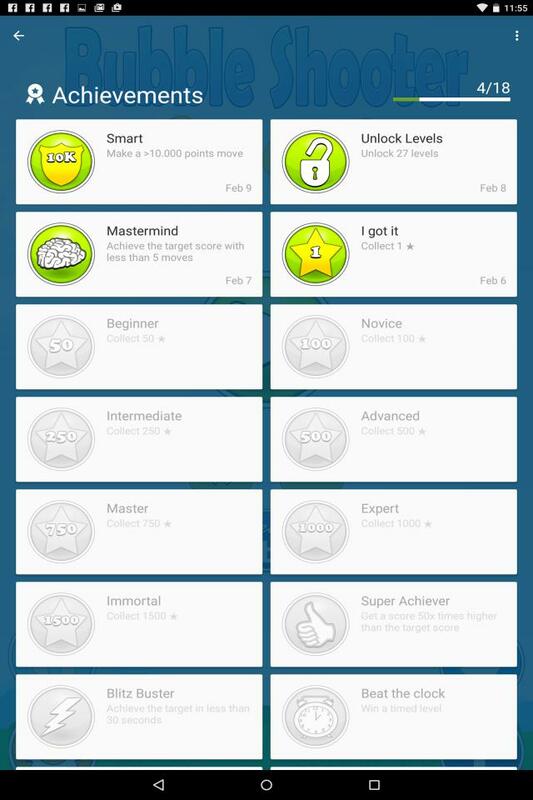 You can also share your scores and achievements with your friends. 8. If you want to log out of Facebook, you can do that by going to -Settings- and pressing -Log Out-. 9. You can control what you share by going to -Settings- and then -Other Settings-. 10. You get notifications when you regain a full set of lives. You can control if and how that happens by going to -Settings- and then -Other Settings-. 11. Press above the cannon to establish your aim. 12. You can move your aim from left to right or vice versa to pick the best shooting position. 13. Watch the shooting-trace and when ready release to shoot. 14. You can cancel the shooting by swapping below the cannon and when the shooting-trace vanishes simply release. 15. 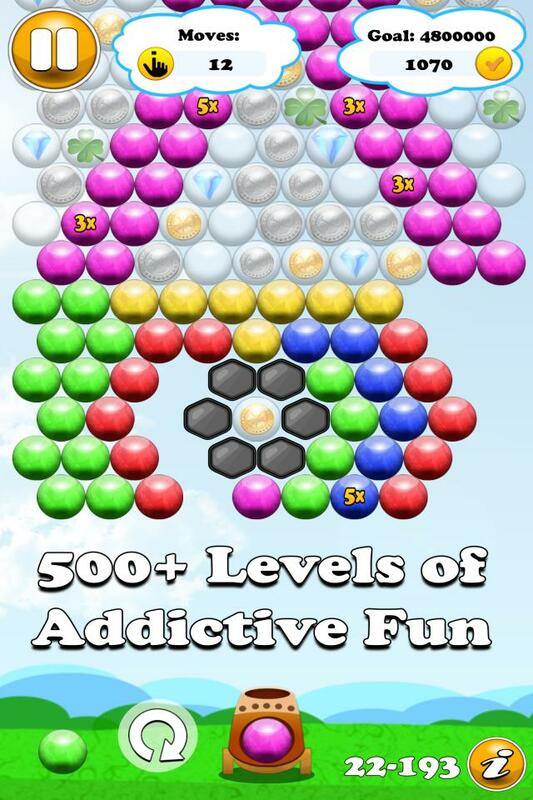 Press the switch button to choose which of the two bubbles you fire. 16. 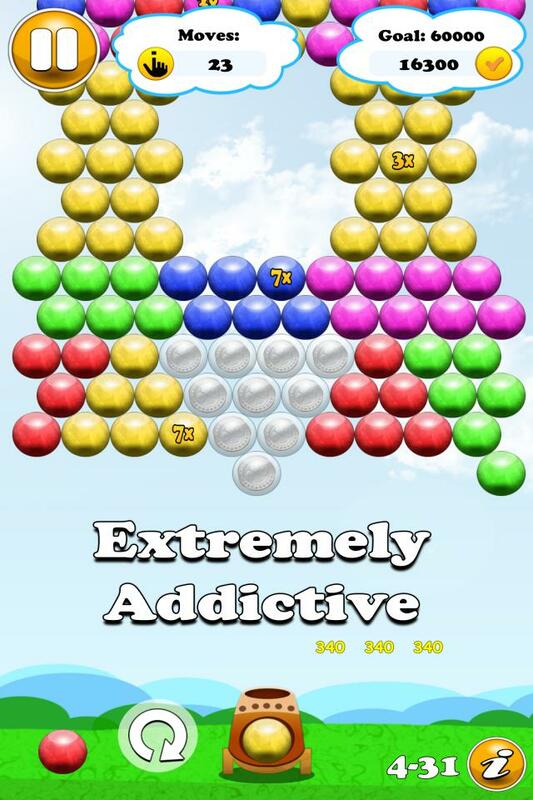 When you form a group of three or more bubbles of the same color the group pops and you score points. 17. The bigger the group you form the bigger the score. 18. When the group is formed by 3 bubbles each bubble has a value of 10 points, when of 4 - 20 points each, when of 5 -30 points each and so on. 19. The bubbles which are detached but not popped fall to the bottom. 20. 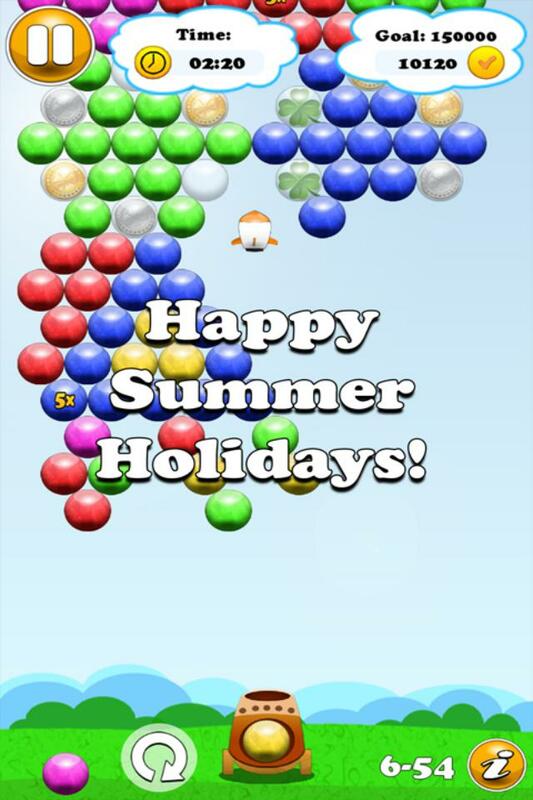 Each bubbles that falls wins you twice the points of the popped bubble. 21. 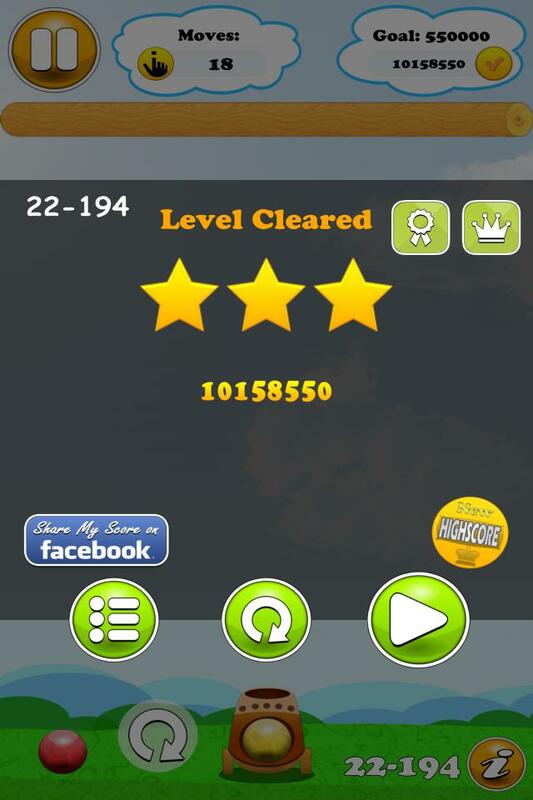 At some levels score multipliers appear. There are 3x, 5x and 7x multipliers. 22. 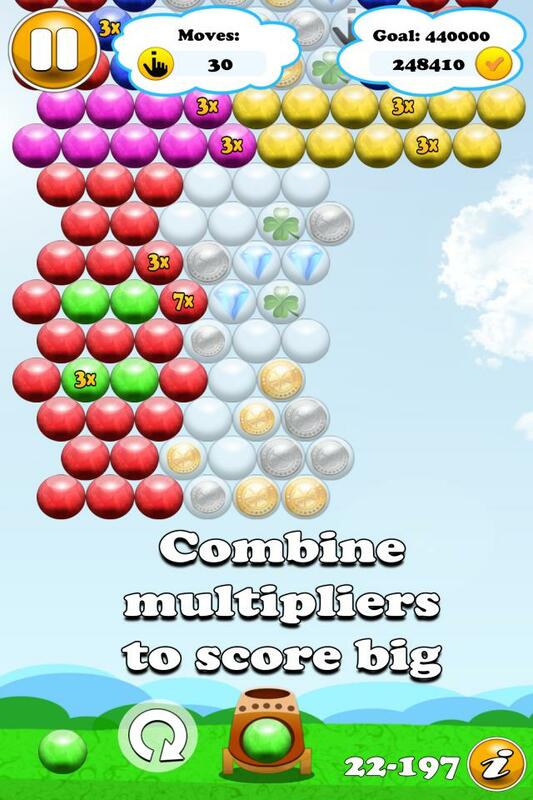 If you combine the multipliers you can obtain exceptional scores. The usual value of a popped bubble is multiplied by the values of the multipliers. 23. 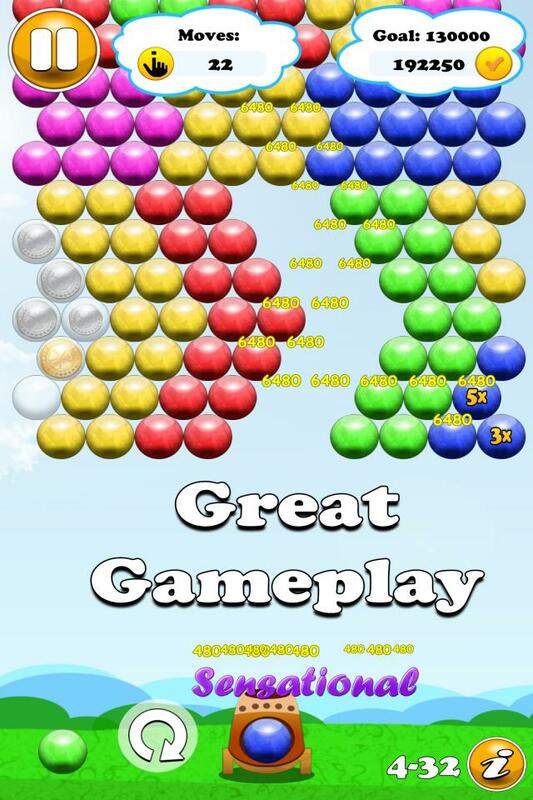 The dropped bubbles are not affected by the multipliers so you need to look out when it is a good choice to drop the bubbles. 24. At advanced levels soap bubbles appear. They may contain silver coins, golden coins, diamonds, clovers, extra moves or extra time. 25. The silver coin wins you 100 points. 26. The golden coin wins you 200 points each. 27. The diamond wins you 1000 points. 28. The clover increases the chance of generating a special bubble by 10 percent. 29. The extra move bonus gives you 5 more moves. 30. The extra time adds 15 more seconds to the countdown timer. 31. 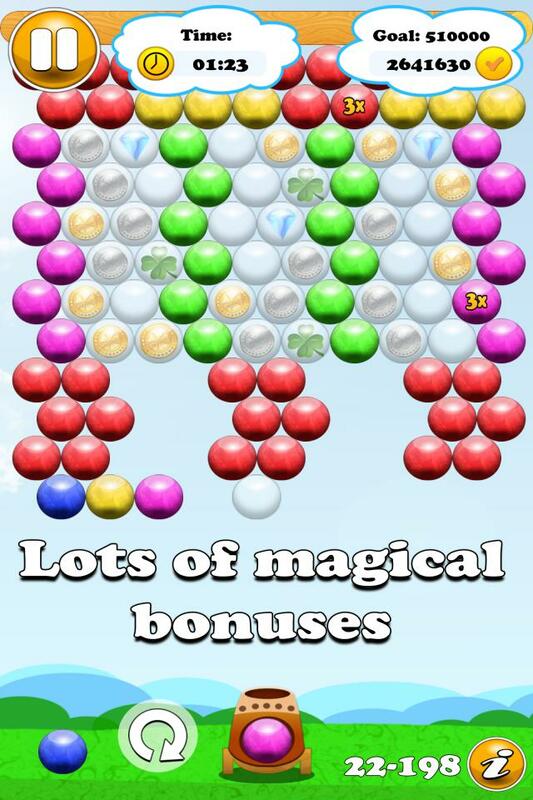 Apart from the usual bubbles at some point in the game you will receive special bubbles. 32. 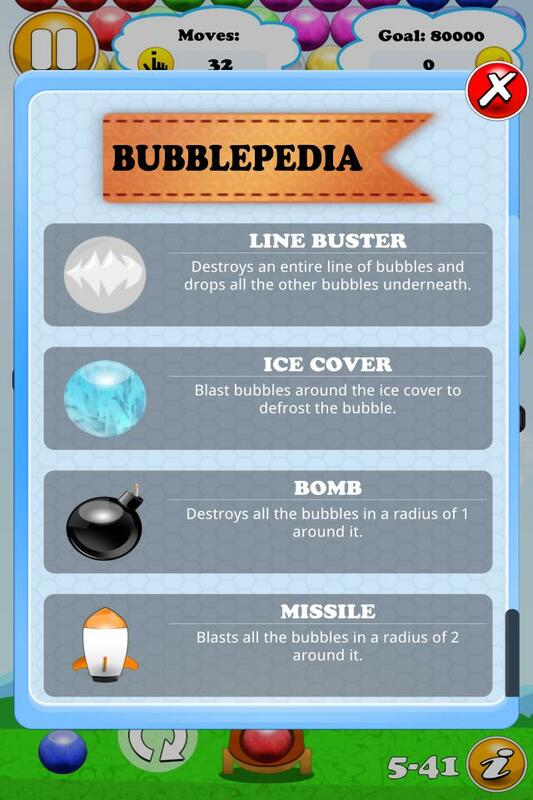 The special bubbles can be: a rainbow bubble, a two-color bubble, a line-buster bubble, a bomb bubble or a missile bubble. 33. The rainbow bubble can form groups with any colored bubble. 34. The two-color bubble can make groups only with the two color types it contains. 35. The line-buster bubble can cut a line through a row a bubbles dropping all the bubbles underneath it.